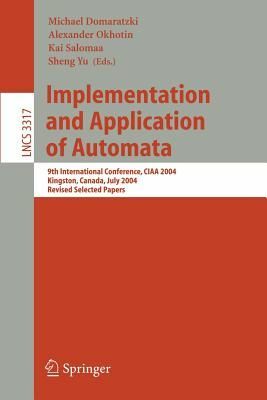 This volume of Lecture Notes in Computer Science contains the revised versions of the papers presented at the 9th International Conference on Implemen- tion and Application of Automata, CIAA 2004. Also included are the extended abstracts of the posters accepted to the conference. The conference was held at Queen s University in Kingston, Ontario, Canada on July 22 24, 2004. As for its predecessors, the theme of CIAA 2004 was the implementation of automata and grammars of all types and their application in other ?elds. The topics of the papers presented at the conference range from applications of automata in natural language and speech processing to protein sequencingandgenecompression, andfromstatecomplexityandnewalgorithms for automata operations to applications of quantum ?nite automata. The25regularpapersand14posterpaperswereselectedfrom62submissions totheconference.EachsubmittedpaperwasevaluatedbyatleastthreeProgram Committee members, with the help of external referees. Based on the referee reports, the paper Substitutions, Trajectories and Noisy Channels by L. Kari, S. Konstantinidis and P. Sos ?k was chosen as the winner of the CIAA 2004 Best Paper Award. The award is sponsored by the University of California at Santa Barbara. The authors of the papers presented here come from the following countries and regions: Austria, Canada, Czech Republic, Finland, France, Germany, Hong Kong, Netherlands, Portugal, Russia, Slovakia, South Africa, Spain, UK, and USA.